Another Friday evening at Fred's. It's great to have neighbours that make good company. 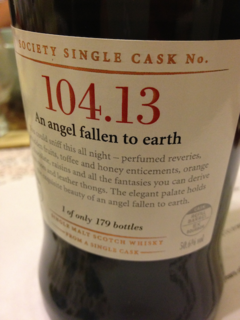 Amongst the selection on offer tonight was a 36 year-old Glen Craig titled An Angel Fallen to Earth. Personally I don't share the enthusiasm of the Sottish Malt Whisky Society for this one. Posted by pab at 00:17 | Comments will be back one day. Please email me instead!